Our Most Popular & Complete Reading Available! The most accurate and life transforming reading available! Ana Maria connects and speaks to your Angels, Guides, Teachers and Loved Ones to provide you with clear, in-depth, practical information and tools on upcoming life transitions, opportunities and challenges. She uses all her psychic gifts and tools which may include Tarot, Astrology, Angel Reading, Akashic Records Reading, Clairvoyant Reading, etc. to help you find the answers you need. She also connects to the Akashic Records, which is a unified field of awareness, Universal Knowledge and healing energy that contains, like a library, all the information of you as a Soul from the past, present and future. Through the Akashic Records we can look at your past-lives, present life and future! All Readings available in-person/telephone/skype. All Birth data must be sent to Ana Maria at least 24 hours prior to your session. Prior to scheduling, please review the disclaimer, cancellation policy, terms and conditions at the end of this page. Due to the amount of bookings Ana Maria has per day, all readings are by appointment only. Once your payment has been received, you will be contacted in order to set up a mutually beneficial appointment time. Why choose Ana Maria as your Psychic and Soul Healer? With over 18 years of professional experience and thousands of clients from all over the world, Ana Maria is a natural born psychic and gifted spiritual advisor and healer. Her sessions include a variety of time-tested tools that assist you in getting the in-depth answers you are looking for. Her compassion and insight can assist your Soul to restore balance and harmony. Schedule your session today. Don't know which one to choose? no worries! When your session is scheduled we can ask your Guides which option is most suitable for you. Ask your Angels and Guides for help and receive clear answers today! All Birth data must be sent to Ana Maria at least 24 hours prior to your session. Soulmate and Love Psychic and Akashic Record Reading! •Wanting guidance about your relationships? •Seeking direction and clarity about your current love life? •Question on attracting your soulmate? •Have you found your soulmate already? •Desiring deeper understanding of unresolved relationship situations? •Want to develop better soulmate relationships. •Need practical, clear guidance, to shine Light on your path to Love? •Wanting guidance from your Angels? Ask your Angels, Guides, Teachers and Loved Ones for help and receive clear answers today! Forecast, Prosperity Forecast, Forecast yearly or monthly analysis; Money, business and career analysis, Progressions and transits. (City, State, Country). Receive clarity and guidance in all areas of your life (your relationships, life purpose/direction, health, finances, career, love/family life, spiritual growth, etc) today! Gift Certificates: Give the Gift of Soul Insight! 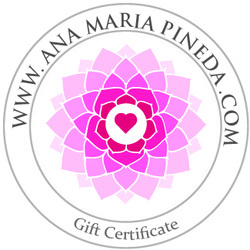 Give yourself and/or your loved one the gift of Insight and Healing with a gift certificate for any of Ana Maria Pineda's psychic and healing services. •seeking direction and clarity around spiritual, emotional or relationship issues? •wanting confidence and confirmation of being on the right path? •open to discovering new and fresh perspective? •desiring deeper understanding of unresolved situations? •Need practical, clear guidance, to shine Light on your path? Want answers from your Angels and Guides today? Purchase today a gift certificate for yourself, friend or loved one. terms and conditions at the end of this page. Due to the amount of bookings Ana Maria has per day, all readings are by appointment only. Once your payment has been received, you will be contacted in order to set up a mutually beneficial appointment time. psychic and gifted spiritual advisor and healer. Her sessions include a variety of time-tested tools that assist you in getting the in-depth answers you are looking for. Her compassion and insight can assist your Soul to restore balance and harmony. Schedule your session today. Healings, Consultations are available in-person/telephone/Skype/email. Specials, discounts and offers cannot be combined. These terms and conditions of use are subject to change at anytime and without notice. The information and services provided by Ana Maria Pineda do not constitute legal, psychological, medical, business, or financial advice. The client, receiving the services provided by this site and its owner, is responsible for all of their own choices and/or actions. Ana Maria Pineda is not a medical nor mental health professional. She does not diagnose nor treat medical or mental health conditions. Her work is intended to complement working with your medical doctor - not replace it. If you have a serious illness, mental health disorder, or any medical concern please consult a medical or mental health professional. If you don’t agree with the cancellation policy, payment policy, disclaimer and/or terms and conditions, please find someone else who may help you. 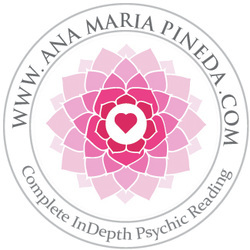 By scheduling any service/ session/ class/ workshop/ event/ reading/ healing/ consultation and/or appointment with Ana Maria Pineda and/or AnaMariaPineda.com and/or other affiliated websites owned by Ana Maria Pineda, it is understood that you fully acknowledge, understand and agree the disclaimer, cancellation policy, terms and conditions as stated here.